Edthena is a classroom observation platform which makes video-based coaching and professional learning easy for any school or district. Classroom observation can occur virtually, at times convenient for the teachers and colleagues. Most recently, Edthena launched a Chromebook app that allows schools and districts to take advantage of the multitude of Chromebooks they have purchased for classrooms. Teachers can use the app to complete an entire video coaching cycle – from recording to upload to feedback – on their Chromebook device. How is Edthena differentiating itself from other PD tools/platforms? Edthena is designed to help all teachers engage in video coaching. Within the Edthena platform, schools can link to their associated professional frameworks and standards to help guide the professional learning process. The format makes it simple and convenient for self-evaluations, PLC meetings, or coaching sessions. What is the pricing model? The Edthena platform is priced on a per teacher basis. The video tools and apps for uploading are available free to Edthena users. Organizations using Edthena work with an expert on the Edthena team who ensures their success. This ranges from goal-setting around a successful implementation to accessing train-the-trainer type materials for use internally. Edthena even offers a collection of best practices for implementing video coaching developed through its experience working with schools across the country. All users can access a diverse set of support resources including step-by-step instructions and how-to videos for using the platform. What makes the new Edthena Chromebook app unique? The Edthena Chromebook app is one of the first Chromebook apps to fully automate the process of recording and uploading videos from a Chromebook. With the app, teachers select a video length and hit record; the app automatically stops recording after the specified time and begins the upload process. This provides schools and educators an intuitive, user-friendly, and reliable solution for utilizing Chromebooks for video coaching. In addition to the user experience, the Edthena Chromebook app addresses the variability of school broadband networks. By integrating cutting-edge web technologies, the Chromebook app is not impacted by momentary bandwidth issues or the need to complete the upload process at a later time. A description of the characteristics—how is it designed for user interface, user experience? What instructional design principles are at work here? Using video observation to help teachers improve their teaching is nothing new. But with Edthena, the process is finally made simple and easy for any organization. It starts with reliable uploads from any device – because if you can’t get the videos online, it won’t matter how good the coaching tools are. 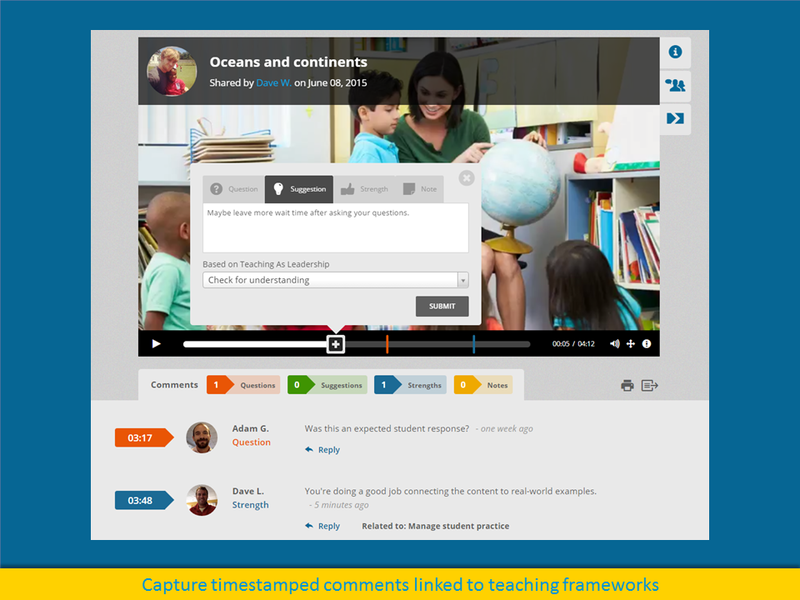 After a teacher uploads a video to the Edthena platform, they can share it with coaches and colleagues who provide timestamped comments categorized as questions, suggestions, strengths, and notes. The platform enables teachers and coaches to participate in collaborative professional learning cycles. Reports and graphs, linked to the school’s or district’s associated professional standards, help identify teaching trends, determine if the professional development is improving teaching practices, and provide a basis for ongoing dialogue about instructional best practices.